Corfu Holiday Palace is a 5-star luxury hotel in Corfu Town, Greece. Guess can look forward to soak up the sun and take a swim in the crystal clear waters of the Mediterranean as the hotel has its own private beach. It happens to be the only hotel in Corfu Island with a direct view to the famous landmark of the island, the islet of Pontikonissi, and the monastery of Mary of Vlachernes, a UNESCO historical monument just 4km away from the old town of Corfu. The hotel is also known for providing a private access to the Sandy beach and its indoor and outdoor pools. The hotel has seawater pool, infinity pool and pre-heated pools. Some of the rooms have a private pool as well. The hotel and the rooms have been carefully designed to ensure that guests have a comfortable and a lavish stay. 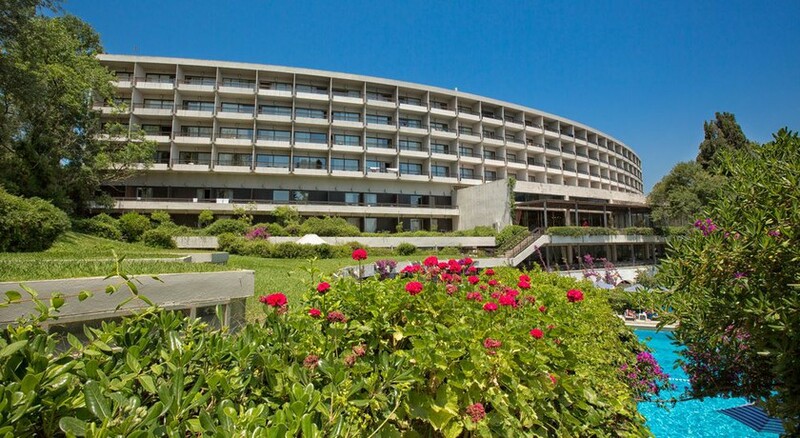 The Corfu Holiday Palace is located 3.6km away from the Corfu International Airport. The nearest bus station is 2.6km away from the hotel. The luxury hotel is closely located to the city centre, making it convenient for guests to check out the major tourist attractions of Corfu. The breathtakingly beautiful islet of Pontikonisi is only 0.7km away from the hotel. Apart from that, major tourist attractions like Panagia Vlahernon Church, Ntougkla Square, Archaeological Museum, Solomos Museum, Museum of Ceramic Art, Serbian Museum, Achilleion Palace, Kolla Square, Saint Spyridon Church, Asian Art Museum, D.Solomos Museum, Port of Corfu, Byzantine Museum, Vido Island are located around a radii of 2-5km away from the hotel. The Corfu Holiday Palace has as many as 15 types of rooms based on amenities, number of occupants, etc. Guests can choose between Villa Sea View with Private Pool, Deluxe Bungalow Sea View with Private Pool, Grand Suite Sea View – Two Bedrooms, “Kalotheatis” 2 Bedroom Bungalow Sea View, Ionian Blue Suite with Sharing Pool, Two Bedroom Suite Sea View, One Bedroom Suite Sea View, Superior Bungalow Sea View with Sharing Pool, Family Bungalow Garden View, Superior Twin or Double Sea View, Superior Bungalow Sea View, Twin Sea View, Superior Twin City – Lake View, Twin Lake View and a Promo Room – Double Garden View. The rooms, which are tastefully designed to accommodate every luxury possible, offer either a sea view, garden view or a lake view. Some of the higher end rooms are equipped with kitchenettes. The Corfu Holiday Palace houses 4 restaurants on its premises which serve a variety of local and international cuisines. The popular Sushi Bar on the premises of this luxury hotels allows the guests to indulge in the Japanese cuisine. Given the proximity of the hotel to the city centre, guests can try out the local cuisine in the eateries and enjoy cocktails at local bars at the Corfu Town. The kitchenette in the rooms also allows guests to indulge in light cooking. 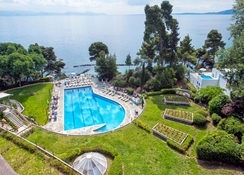 The Corfu Holiday Palace has an in-house instructor for swimming, snorkelling and stand-up and paddleboard lessons. The luxury hotel also houses tennis court, bowling rooms ping-pong table, billiards table. The private beach allows the vacationers to indulge in sunbathing. The hotel has an outdoor pool with salt water, an indoor heated pool (April & October), Sandy paradise beach, which can be accessed an incline elevator or a road, a spa and wellness centre with sauna, solarium, massage services, aroma therapy, manicures-pedicures and many other beauty services.